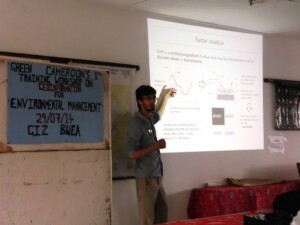 On the 29th of July 2014, Green Cameroon held its first workshop on GeoInformation for Environmental Management at the office of the GIZ in the MINFOF. 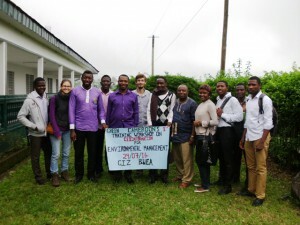 The workshop was directed at local stakeholders such as our colleagues from the FAAFNET, GOOAHEAD, and ICENECDEV and at the students of the University of Buea who came in number. The purpose of the workshop was to present the possibilities offered by GeoInformation and especially Remote Sensing to assist environmental management and the solving of environmental issues. The presentation gave an overview about the principles of GIS, RS and GeoData as well as on their fields of application and advantages. By the end of the workshop we could demonstrate that Remote Sensing is a powerful and accessible instrument to address environmental questions. This training session was however only an introduction and did not aim at teaching GIS. That is why Green Cameroon proposed to apply GIS and RS to environmental issues within its scope of interest: assessment of deforestation with Landsat imagery and mapping of environmental risk zones (flood, soil erosion). The participants have been invited to join us in this work as an opportunity for them to gain practice and insights into the application of GeoInformation. The practical work sessions will be held starting from the 4th of august on a weekly basis in the office of Green Cameroon. We would like to thank the GIZ that made this workshop possible by providing their conference hall and other facilities. GREEN CAMEROON IS GOING INTO THE NEWEST TECHNOLOGY TO HELP PROTECT AND CREATE AWARENESS ABOUT OUR ENVIRONMENT NO MATTER IT’S LIMITED RESOURCES, THESE SHOWS THAT IF THIS ORGANISATION THAT IS IMPACTING THE ENVIRONMENT AND THE POPULATION THIS MUCH IS SUPPORTED THEN BETTER RESULTS AND A WIDER SCOPE WILL BE REACHED.TOGETHER LETS SUPPORT AND PROMOTE GREEN CAMEROON !! Will love to undergo a training with you on GeoInformaic(be it GIS, Remote sensing, Geo database, Photogrammetry ). i am a final year student doing Geomatics Engineering in the university of dschang. so if any occasion comes up please alert me. Thanks.